The Napa – Understanding the herd as a single unit - September 2011 Camelid Quarterly Article. The Big Makeover – Llama breed standards and the show ring that was - June 2011 Camelid Quarterly Article. Spot On! – Nomenclature of the spotted llama - March 2011 Camelid Quarterly Article. The Road to Llamaville – The llama industry has seen much positive change since the publishing of Dan’s first llama related article, but not so much as to yet render this article obsolete. Suri Worry – This article was written as a response to the hysteria that followed when suri mania prompted a breeder to misrepresent a suri alpaca llama hybrid named ‘Magnifire’ as a full blood registered llama. Many without an understanding of genetics were duped and invested unwisely, but ultimately it was the suri llama that paid the greatest price. Managing SLA Bloodstock – At the time of publishing Dan was no longer serving on the SLA board, but graciously volunteered this article for the SLA B.O.D.’s. It is a very useful article for those serious about producing better suri llamas. Line Breeding to Outcrossing – The name says it all. This topic is huge and this is merely intended as a primer for an industry that has long professed the evils of linebreeding. This is an important article for every llama breeder to read. Genesis of a Breed - The SLA's Roll – An article outlining the process of breed development and how Dan envisioned the SLA might help guide this process. The Argentine – An article commending the dedicated members of ALA, and addressing the importance of adopting breed standards and proper selection within the Argentine llama population. 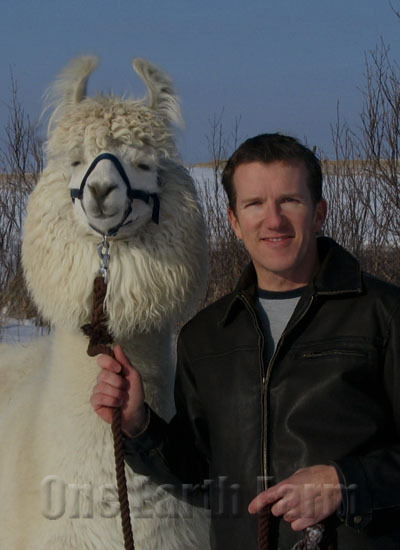 Dan has long had an affinity for Argentine llamas. Can You Say Llama Breed – An excellent article explaining the process of breed development and how that process pertains to llamas and our industry. Boys on the Side – This is an important article for an industry that still undervalues the male component in the llama population and overvalues the outcross as a breeding system.